339 pages | 101 B/W Illus. Due to the increasing demand for power generation and the limited nature of fossil fuels, new initiatives for energy development based on electrochemical energy conversion systems are springing up around the world. Introduction to Electrochemical Science and Engineering describes the basic operational principles for a number of growing electrochemical engineering-related technologies, including fuel cells, electrolyzers, and flow batteries. Introduction to Electrochemical Science and Engineering is an ideal textbook for undergraduate engineering and science students and those readers in need of introductory-level content. Furthermore, experienced readers will find this book useful for solidifying their electrochemical background. 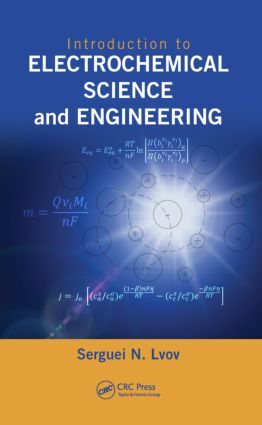 "This textbook is the first true introduction to modern electrochemical science and engineering that is directed at senior level undergraduates in engineering disciplines. The wide ground covered includes both an introduction to fundamental electrochemistry and its application to understanding electrochemical power storage and conversion devices and corrosion. It fills an important gap that has been missing in the field and will be an excellent resource for students and instructors alike." "… takes readers on a journey from fundamental electrochemistry to understanding modern electrochemical energy conversion systems (fuel cells, electrolyzers, batteries) and economically important phenomena such as corrosion. The book is distinctive in making it possible for undergraduate students to learn electrochemical science and engineering in one semester. This is facilitated by quizzes, videos of laboratory experiments, and video-based assignments that accompany the text. The book can also be used by graduate students, industry professionals, and researchers who have not studied electrochemistry but need to work in related areas." "There is a profound clarity of concepts and completeness of the material covered. S. Lvov is making the connection of electrochemistry with physical chemistry principles by involving a rigorous treatment of ionic equilibria and kinetics." Serguei N. Lvov is a professor of energy and mineral engineering, a professor of materials science and engineering, and a director of the Electrochemical Technologies Program at the EMS Energy Institute of The Pennsylvania State University, University Park, USA. His areas of research include electrochemistry, thermodynamics, material sciences, and environmental sciences. He is the author of more than 100 peer-reviewed papers, 2 books, 6 book chapters, and 2 US patents.